We live in a world that seems to be divided and if you spend any amount of time watching the news or reading down through your Facebook feed, you will find that people have a lot of negative things to say about each other. Unfortunately, it has been like that for thousands of years and even though we are seeing small changes, they don’t often seem to be enough. Rather than letting yourself be discouraged by the negative news that you might hear, it’s good to hear something positive every once in a while. This is one of those positive news stories that is going to restore your faith in humanity again. Following my appointment this morning to check on our growing baby boy, my husband and I stopped at Walmart in Evans to pick up a couple of things. As we were walking to the refrigerated section, we noticed a woman who had passed out and fallen on the floor. Being a registered nurse, my first instinct was of course to stop, assess, and be there to help. She had regained orientation, but did say she was on blood thinners and felt dizzy. 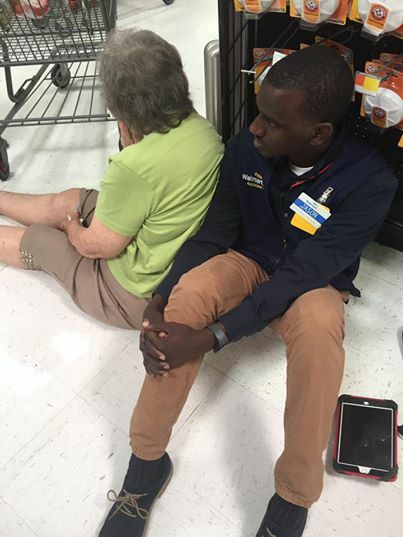 So I stayed with her, along with her daughter and the Walmart personnel, until the ambulance came and tried to encourage her to stay seated. The Walmart staff was amazing. They kept in contact with dispatch as we waited on the bus to arrive. Then there was Jason. I don’t know his last name, but this man, no questions asked got down on the floor with this woman and supported her back so she could lean against him. He literally got down on the floor to serve her, not because he was asked to do it, he wasn’t, but because he wanted to. The media lately shows our country divided, filled with hate and ra-cial tension, but this right here was one human being loving and serving another without condition of ra-ce or obligation. While we waited, another man stopped, knelt down and prayed over this woman. What I experienced today was love, kindness, and serving. We are human beings, each and every one of us regardless of how much pigmentation our skin has or doesn’t have. I couldn’t help but share because the media doesn’t seem to report this… the unity and the positive that occurs. This right here is real life, this is what it’s all about, not hate.